I’m not exactly sure how to hatch out chicks at home using a incubator. We tried it once. We used a small styrofoam incubator a few years ago and attempted to hatch chicks very unsuccessfully. We religiously monitored the temperature, humidity and turned the eggs three times a day. At the end of the 3 weeks of torture trying to hatch out these chicks, some of the eggs finally started to crack open. Yea! We were all excited for about 30 seconds. We hatched 2 chicks and had 40 something dead ones. And then the 2 chicks that did hatch, died soon after. It was 3 weeks of constant care and way too much anxiety and devastation to hatch out chicks at home in the little white styrofoam incubator on our kitchen counter. Way too much drama.. Actually, now that I think about it, we’ve had a lot of drama filled chicken stories: here, with the package of dead chickens and here ,with the phone call from Nancy at the Post Office. For several weeks, my 6 year old daughter has been very excited about the fact that one of her chickens, named Ms. Banty, went broody. 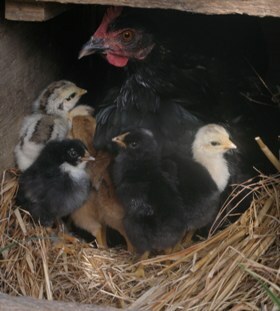 My kids are always looking out for broody hens on our farm. They’ve learned how to recognize which hens are broody and which ones are not. She noticed Ms. Banty made a nest and went broody in our tool shed. When the hatch day approached, she daily checked on that hen to see if she had any chicks under her. She runs out the door with a small dish of water. She spent that day as a chicken doula. She watch and waited and periodically gave me updates on how many chicks had hatched. At the end of the day, Ms. Banty had 8 chicks and I had a very happy 6 year old little girl. I’m always amused by my children and their perceptions of the farm. I will forever be amused when I think about the day the chicken was in labor! That’s how we hatch out chicks on our farm and so far, it’s been a very rewarding experience for everyone. That is so cute…and funny 🙂 We are still hatching our chicks the incubator way. Our chickens are penned up so they don’t seem to brood. But I have always wanted to watch a “hen in labor” 🙂 Maybe some day! Thanks for sharing….that was way too cute!